"I'll Be Around" was record by The Spinners (known as "Detroit Spinners" in the UK) in 1972. The song was co-written by the legendary Thom Bell and Phil Hurtt and produced by Bell. The production of the song gives it a smooth, mid-tempo feel, with guitar at the forefront and punctuation from female background singers, horns, strings and congo-playing from Larry Washington. Bobbie Smith handles lead vocals on the song. The song was included on the group's 1972 self-titled album on Atlantic Records, their first album release for the label. It was initially released as the B-side of the group's first single on Atlantic, with "How Could I Let You Get Away" being the A-side. Radio deejays, however, soon opted for "I'll Be Around" which led to Atlantic flipping the single over and the song became an unexpected hit, eventually spending five weeks at number one on the U.S. R&B chart (the group's first number-one on the R&B chart) and reaching number three on the U.S. Pop chart in the fall of 1972. 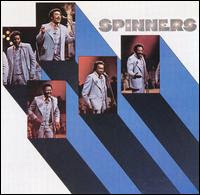 It also reached sales of over one million copies, The Spinners' first record ever to do so. The success of "I'll Be Around" would be the first in a series of chart successes The Spinners and Bell would have together during the 1970s. Mid nineties, NY underground hero, gravel voiced Nine sampled the track on his 1995 track 'Any Emcee' using the opening guitar riff throughout the track. Nine spits his usual sandpaper toned rhymes over this sick beat which was produced by Rob Lewis. Rob Lewis produced a number of tracks for Nine on both his albums but rarely worked with other artists. This 12" was Nine's second 12" from his debut album and is a dope up tempo track with the usual Braggadocio rhymes. This 12" was released on Profile and I picked it up in Handspun records (which alter went on to become Deal real for those London heads who remember) for about £6. Its a good 12" and I still listen to it regularly along with both of Nine's albums. 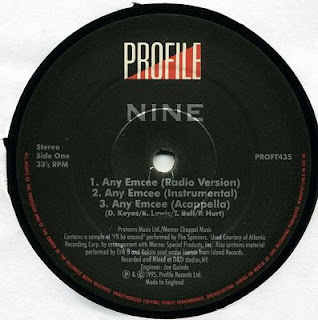 Although Nine was a good lyricist, with his own style and pretty decent production he never quite made it as big as some of his other NY contemporaries and I think thats down to the fact that he never really had a crew and for a rapper to not have a crew in the mid nineties was a major set back. remember this was just before the real rise of the independents and majors was still the main way to make it. Check the link below for the sample and the 12".